We, the Minister of Road Transport and Bridges of Bangladesh, the Minister of Information and Communications of Bhutan, the Minister of Road Transport and Highways and Shipping of India, and the Minister of Physical Infrastructure and Transport of Nepal, (hereinafter referred to as “BBIN Transport Ministers”), met in Thimphu, Bhutan on the 15th of June 2015. We expressed our appreciation to the Honorable Minister of Information and Communications of Bhutan, His Excellency Lyonpo D. N. Dhungyel, for convening this Meeting, and for the gracious hospitality and excellent arrangements made for it. We were joined in our meeting by the Vice President of the Asian Development Bank, Mr. Wencai Zhang. 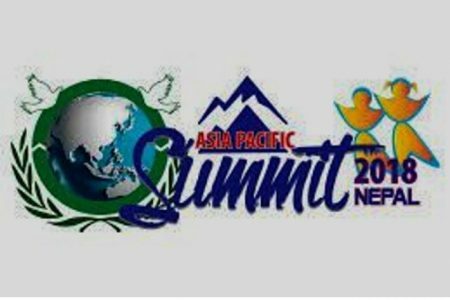 We recall the strong determination expressed by the Heads of State of Government of the South Asian Association for Regional Cooperation (hereinafter referred to as “SAARC”), at their Eighteenth Summit held in Kathmandu, Nepal on the 26th and 27th of November 2014, “to deepen regional integration for peace, stability and prosperity in South Asia by intensifying cooperation, inter alia, in trade, investment, finance, energy, security, infrastructure, connectivity and culture; and implementing projects, programmes and activities in a prioritized, result-oriented and time-bound manner.” We further recall their renewed commitment to “substantially enhance regional connectivity in a seamless manner through building and upgrading roads, railways, waterways infrastructure, energy grids, communications and air links to ensure smooth cross-border flow of goods, services, capital, technology and people,” directing relevant authorities to initiate national, regional and sub-regional measures and necessary arrangements to this end. We took note of the progress made in formulating and negotiating the Motor Vehicles Agreement for the Regulation of Passenger, Personal and Cargo Vehicular Traffic between the SAARC Member States (hereinafter referred to as “SAARC MVA”), but, at the same time, recognize the need to accelerate cross-border transport facilitation to deepen and hasten regional integration through sub-regional measures in line with the directive of our leaders as articulated in the Declaration of the Eighteenth SAARC Summit. We endorsed and signed the Motor Vehicles Agreement for the Regulation of Passenger, Personal and Cargo Vehicular Traffic between Bangladesh, Bhutan, India, and Nepal (hereinafter referred to as “BBIN MVA”), which was drafted on the lines of the SAARC MVA. The finalization of the BBIN MVA would allow us to move forward, in an accelerated fashion, with implementation of land transport facilitation arrangements between and among our countries. This, in turn, would enable the exchange of traffic rights and ease cross-border movement of goods, vehicles, and people, thereby helping expand people-to-people contact, trade, and economic exchanges between our countries. We will endeavor to accelerate the preparatory steps for the effective and sustainable implementation of the BBIN MVA, starting with the formulation, negotiation, and finalization of the necessary legal instruments and operating procedures. 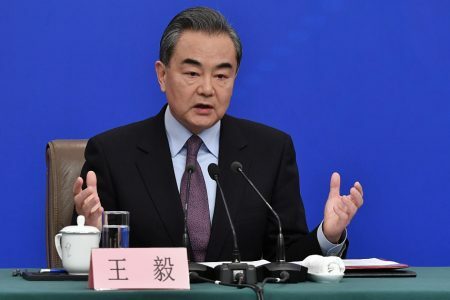 We recognize that the BBIN MVA is a complementary instrument to the existing transport agreements or arrangements at the bilateral levels that the Contracting Parties will continue to honor. Implementation difficulties, if any, will be resolved based on provisions of the BBIN MVA. Staged implementation from October 2015. We strongly encourage key officials of relevant ministries and agencies concerned in our respective countries to mainstream the relevant provisions of the BBIN MVA, and subsequent legal instruments into their operations. We instruct our Nodal Officials or National Land Transport Facilitation Committees to monitor the work plan, and bring to our immediate attention any issues that may arise in the course of its implementation. We acknowledge the technical and facilitating role played by the Asian Development Bank (ADB) in taking the BBIN MVA initiative this far and request ADB to continue providing much needed technical support and other related arrangements necessary to ensure the effective and efficient implementation of the work plan. We are pleased with the progress of improving physical road connectivity between our countries. We note that the ADB-supported South Asia Sub-regional Economic Cooperation (hereinafter referred to as “SASEC”) program is helping enhance interconnectivity between our four countries. We recognize that our four countries comprise a dynamic sub-region, which requires efficient land transport connectivity between the concentrations of supply and demand, which are widely dispersed. We take note that 30 priority transport connectivity projects with an estimated total cost of over 8 billion US dollars have been identified, which will rehabilitate and upgrade remaining sections of trade and transport corridors in our four countries. These corridors and associated routes were determined based on analysis of patterns of regional and international trade. We take note of the finding that transforming transport corridors into economic corridors could potentially increase intraregional trade within South Asia by almost 60% and with the rest of the world by over 30%. We acknowledge that apart from physical infrastructure, the development of economic corridors within and between our countries requires the implementation of policy and regulatory measures, including the BBIN MVA, which will help address the nonphysical impediments to the seamless movement of goods vehicles and people between our four countries. We take note that the BBIN Friendship Motor Rally is planned to be held in October 2015 to highlight the sub-regional connectivity and the scope and opportunities for greater people-to-people contact and trade under the BBIN initiative. We have today flagged off the route survey for the Rally. We express our appreciation and gratitude to the Royal Government of Bhutan for the warm hospitality and excellent arrangements made for this Meeting. We thank the Asian Development Bank for the substantial support they have extended to the Meeting of the BBIN Transport Ministers. 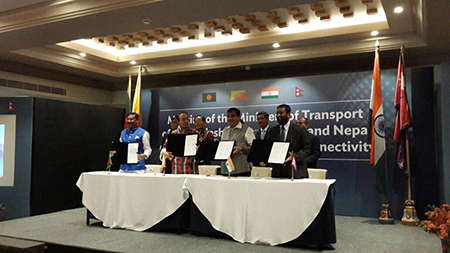 This Joint Statement of the Meeting of the Honorable Ministers of Transport of Bangladesh, Bhutan, India, and Nepal on the Motor Vehicles Agreement for the Regulation of Passenger, Personal and Cargo Vehicular Traffic Between Bangladesh, Bhutan, India, and Nepal was endorsed at Thimphu, Bhutan on 15 June 2015 by: His Excellency Mr. Obaidul Quader, Minister of Road Transport and Bridges, Bangladesh; His Excellency Lyonpo D. N. Dhungyel, Minister of Information and Communications, Bhutan; His Excellency Mr. Nitin Jairam Gadkari, Minister of Road Transport and Highways, and Shipping, India; and His Excellency Bimalendra Nidhi, Minister of Physical Infrastructure and Transport, Nepal.